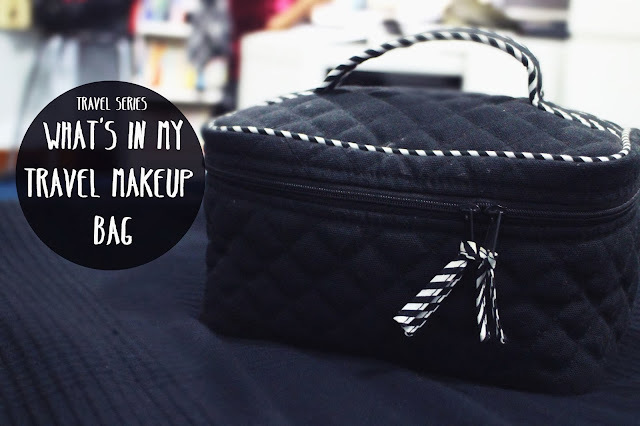 Travel Series: What's in my Makeup/toiletries bag ? I have always had a fascination in what people take with them in their makeup bags when they travel and seeing that I do travel quite often between HK and SG, I'd thought I'd make a video of my own showing you lovelies, what I take with me! As you can tell from the tag above, this is a mini series so I'll be doing another video showing you guys what I take with me on the plane in my Carry on bag which will also feature another beauty/makeup pouch with all my airplane beauty goodies as well as a blog post that Sam & I will be doing on our travel tips & tricks! The bag that I use to take all my "necessities" is from NaRaYa, which you can find both in HK and more commonly in Thailand. I got this travel bag for about 220 Bhat (SG$ 8!!) which I felt was a great deal and despite not having a water proof lining on the inside, it does a great job in holding everything that I need. Please keep in mind that I don't take a lot of toiletries with me just because I do have a set of toiletries that I keep in HK and hence this video showcases mainly makeup products. Top shop lipstick in "The damned"
What are your holy grail travel makeup/skincare products?